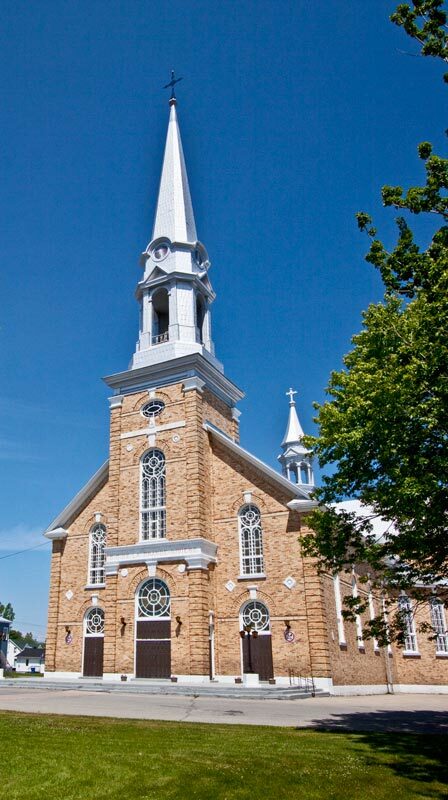 While we were cruising the waters around Quebec back in our life aboard Starsong, we noticed that in each small town we passed there was one ornate church steeple that rose high above any other structure in the town. 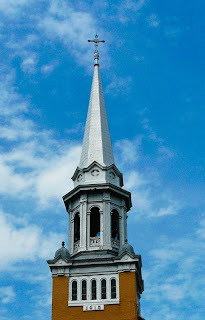 The sun reflecting off the church steeple was like a lighthouse beacon marking the center of the town. We could imagine sailors returning from a stormy day at sea viewing their church steeple, and giving thanks for their safe passage home. 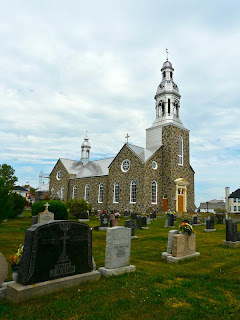 Along the coastal road today, we are passing through the center of one small town after another, many named for saints. 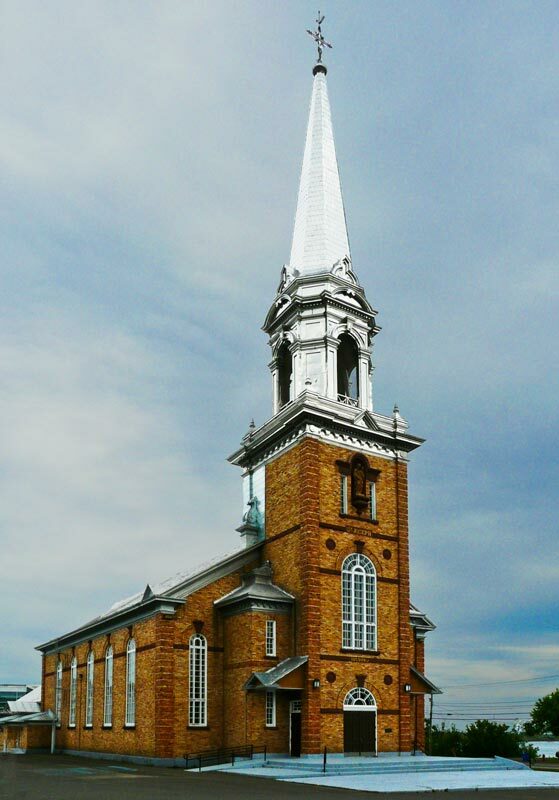 The houses and businesses along our route are modest and undistinguished for the most part, but the Catholic Churches are built on a grand scale, and their steeples are richly ornamented. 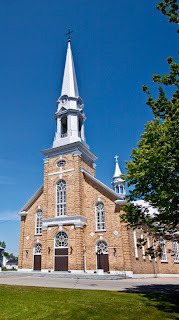 Several of the churches have silver roofs that shine like mirrors in the sun. Our drive is a steeple chase—we drive from one church steeple to the next, stopping to admire each one, and there are many. In addition to a beautiful Catholic Church, each little town also has at least one scenic roadside park with picnic tables and rest rooms. Most of the parks overlook the ocean. We enjoy our picnic lunch at a table beside the entrance to a marsh nature trail. Hundreds of gulls are resting and fishing in the tidal pond nearby. Today is a beautiful day. Most houses have colorful laundry billowing on the lines in their backyards. The full clotheslines remind us of Narda, our Jonesport Seaview House landlady, who apologized to us in case we noticed that the sheets on our bed were a bit wrinkled. She had laundered them and hung them on the line to dry, but it rained, and she had to put them in the dryer. She was very sorry that she couldn't offer us line dried sheets, which are, apparently, far superior. Not having slept on line dried sheets since childhood, neither one of us can remember what we are missing. But I digress. The point is, we know the laundry is hanging on the lines to dry today, because tomorrow it will rain again, as we continue south to Halifax.